Last week we introduced our Best Value series with a post on the top nonprofit management software with the best range of functionality for the cost. For our second post of the series, we decided to target one of the most-used types of software among businesses: accounting solutions. Virtually every business — regardless of size or industry — needs a solution to manage their expenses, receipts, payroll and other financial activities. Whether a restaurant, retail store or services-based business, you’ll greatly appreciate an application that organizes and monitors your company account and accompanying transactions. Even if you already have an accounting solution in place, it could be costing your business more than necessary. We’re here to help users of small or mid-sized companies decide if a best-value software package is the best fit for your business. If you’re interested in learning more about how we define and determine best-value software, take a look at our Best Value introductory post. Finished reviewing our selection process? Great! Let’s discuss how to navigate the plethora of business accounting software and top fiscal features. As anyone who has ever searched for an accounting program knows, it can be tricky to locate a quality solution with all desired capabilities that is priced affordably. Odds are you’ve sacrificed functionality for cost, or vice versa, at some point during your hunt for an accounting product. Another popular scenario involves you believing that you’ve finally discovered a solution that addresses your company’s finance management requirements, only to realize later on that you need to tweak the software or purchase a number of add-on modules to make it operate how you need it to. 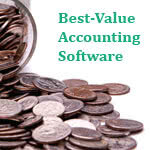 In short, finding accounting software with the right bundle of characteristics ends up being far more complicated than you expect at the outset. Of course, as the Business-Software.com team covered in our Nonprofit Week, certain types of organizations have even more particular needs: nonprofits require accounting solutions with specialized functions to help manage donations and grants, track funding and generate NPO tax forms. In instances such as this, the general features offered in a standard accounting solution will prove more of a hassle than the lower price is worth. A best-value solution like the ones we’ll spotlight below would end up costing a nonprofit or other niche-industry business more time and money to reconfigure for specific needs. But for smaller companies seeking an accounting system with standard functionality, a best-value solution is a very realistic possibility. The majority of leading accounting solutions tailored for smaller companies offer a surprisingly large range of features, which can be great for businesses on the hunt for a specific suite of tools. Yet there are a number of standard accounting-related functions beneficial for financial management, such as comprehensive invoicing and billing, accounts payable and received, expense or project tracking, business insight reporting and transaction automation abilities. Other accounting modules including time tracking and contact management and have also grown in popularity. Considering an accounting system must be adaptable to an assortment of users, customizability and multi-currency capabilities are also deemed important attributes for today’s software. Of course the extent of each of these features should be compared to product price and business needs. AccountEdge Pro – Complete mobile functionality and deployment flexibility make AccountEdge Pro an affordable, fully featured financial suite worth investing in for organizations interested in accessing their accounting solution on the go. BillQuick Online – Between its attractive pricing plan and installation-free application, BillQuick Online provides a cost-effective, no-fuss accounting system for companies in need of an easy-to-use platform. Zoho Books – Comprehensive integration abilities, accountant invites and account watch-lists are just 3 of the many reasons why Zoho Books is a great option for businesses seeking an all-inclusive accounting solution. Yet one of these specialized solutions for accounting and financial activities stands out from the rest, according to our readers. The results are in — you’ve chosen AccountEdge Pro as the accounting solution with the best balance of robust functionality and affordability. AccountEdge Pro enables companies to easily and efficiently manage the majority of their financial processes through a range of productive modules. The software’s dynamic suite of tools includes account management, extensive banking abilities, time tracking, accounts payable and received, tax forms, and ecommerce and checkout platform add-ons. AccountEdge Pro also offers a variety of additional functions not available on other systems, such as online store capabilities, payroll, contact management and inventory monitoring. And at $299 for a single Mac user ($399 for a Window user), the software is an incredibly affordable option for companies operating on a tight budget. With versions for Mac and Window available, AccountEdge Pro’s flexibility makes it appealing to a variety of businesses with different devices and accessibility needs. What’s more, the system offers a comprehensive mobile application for iPads and iPhones that processes payments, maintains lists, records sales and syncs with your desktop version of AccountEdge Pro. On the whole, AccountEdge Pro provides business with just the tools they need to streamline financial operations, and at an incredibly budget-friendly price. Want to tell us about your favorite software programs? Connect with us on Facebook, Twitter, Google+ and LinkedIn and be on the lookout for our next Best Value polls!